This page provides general guidance on survey timing and the seasonal constraints which apply to ecological survey work. Survey periods can vary depending on objectives and methods employed, and are often influenced by environmental factors such as site characteristics, weather or geographic location. Professional advice is always recommended to identify which surveys are likely to be required, how best to carry them out, and to ensure survey scope is proportionate and designed to answer the right questions. This survey technique is used to identify and classify habitats. 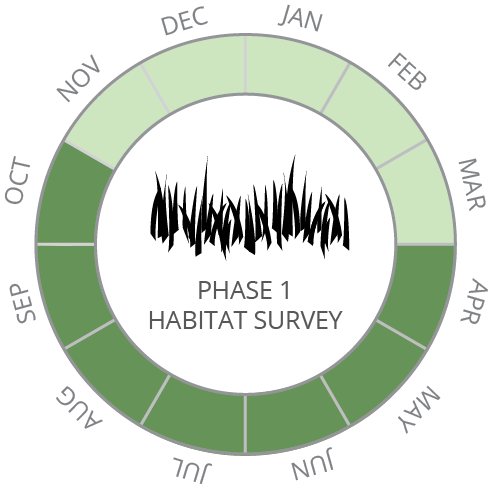 Phase 1 habitat surveys can be completed throughout the year, but surveys during the spring and summer allow more detailed species lists to be put together which can aid the classification of habitats. 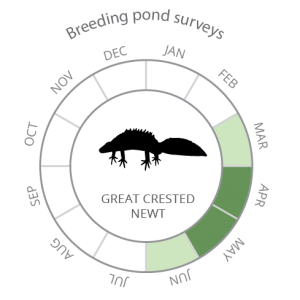 A Phase 1 habitat survey (see above) which is ‘extended’ to include an assessment of a site’s potential to support protected species (such as bats, great crested newts, badgers, reptiles and nesting birds). 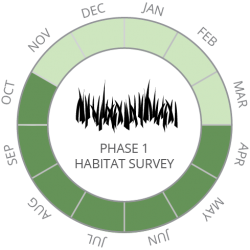 The findings of an extended phase 1 habitat survey can be used to determine whether further detailed survey is likely to be required (such as further botanical survey (NVC survey) or more detailed protected species survey). As above, an extended phase 1 survey can be carried out at any time of year although there may sometimes be good reasons to target particular seasons (for example, to help identify the likelihood of bats being present, or to visit and evaluate a pond in advance of the survey period for great crested newts). National Vegetation Classification (NVC) survey is a detailed botanical survey technique that is required where habitats of ecological value require more in depth evaluation. NVC survey is best carried out during spring and summer months. The optimum period for survey varies depending on the habitat type under consideration, and advice should be sought from an ecologist. 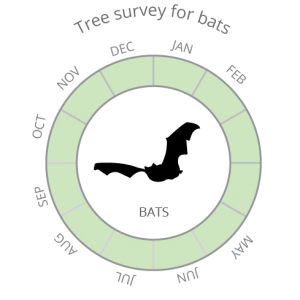 Survey work for bats is generally seasonally constrained and needs to be carefully planned. 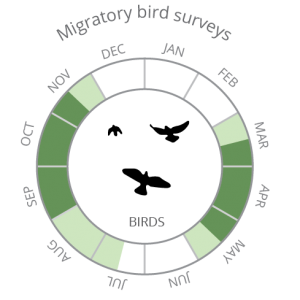 The key period for carrying out activity survey work (evening emergence surveys or dawn roost return surveys) is between May and August. Multiple visits are often required to determine the presence of roosts. 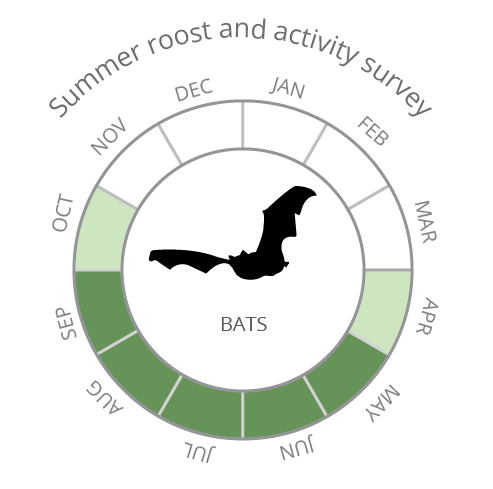 These surveys are typically carried out between April and October in order to determine flight paths, foraging behaviour and areas of habitat used by bats; multiple visits are often required throughout this period to give a representative picture. Buildings can be assessed for their potential to support bat roosts throughout the year. In winter months, the likelihood of finding roosts is reduced, although evidence of use may still be present in sheltered areas, such as roof voids. Where an inspection identifies potential for roosts to occur, follow up survey (i.e. evening emergence surveys or dawn roost return surveys, see above) is normally needed. 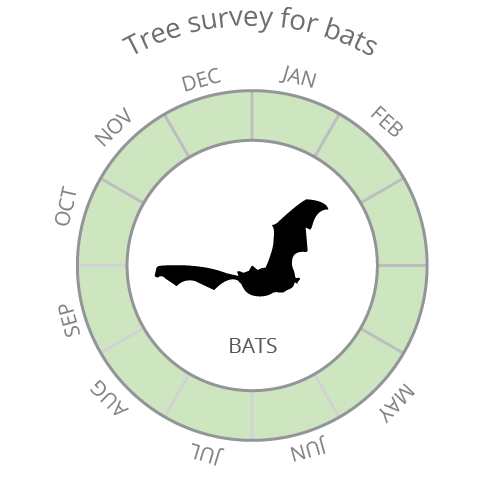 Trees can be assessed for their potential to support bat roosts throughout the year. When foliage is absent, cavities in a tree can often be more easily identified from the ground. The winter is a good time for carrying out ground-based preliminary assessment of Potential Roost Features (PRFs). Aerial inspections of trees (PRF inspection survey) can be carried out throughout the year. 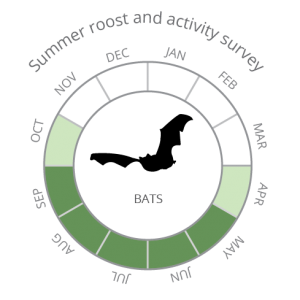 Tree survey work can also include evening emergence surveys or dawn roost return surveys during spring, summer and autumn months. 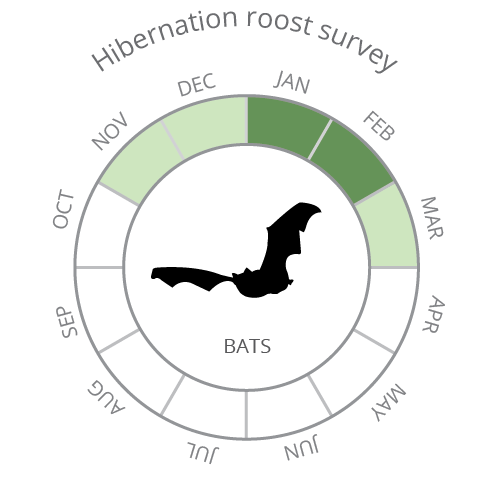 Bats hibernate during winter months (November-March). January and February is a key period for survey. Swarming behaviour, which can occur at hibernation sites, occurs during late summer and autumn. 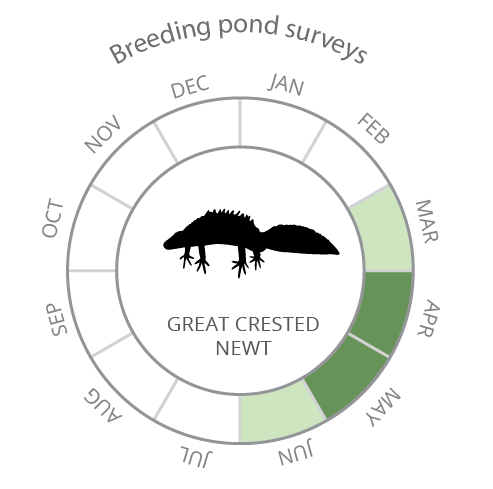 Great crested newt (GCN) survey work is seasonally constrained. Pond surveys, to determine GCN presence / absence and population size, should be carried out between mid-March and June. Multiple survey visits are required (a minimum of four and a maximum of six), with at least half of these visits during the period between mid-April and mid-May. This survey technique can be carried out between 15 April and 30 June. If GCN presence is detected, follow up survey work is often likely to be required, meaning the eDNA survey timing needs to be carefully planned to avoid the risk of needing to carry out further survey the following year (i.e. a population estimate survey, see above). 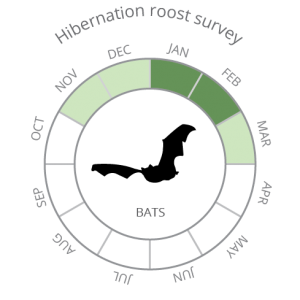 Habitat Suitability Index (HSI) assessment can potentially be carried out at any time of year, although certain indices (such as shade and plant cover) are best measured during summer months. This technique is limited to an assessment of the likely suitability of a pond for great crested newts; it is a useful tool to scope survey requirements but is not sufficiently precise to conclude whether or not a particular pond will support newts. 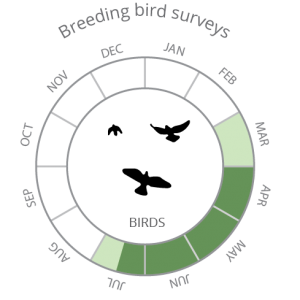 The breeding season for almost all UK birds is within the period February to August inclusive; dates vary by species and can be affected by prevailing weather conditions. The majority of species do not start nesting until March or April. 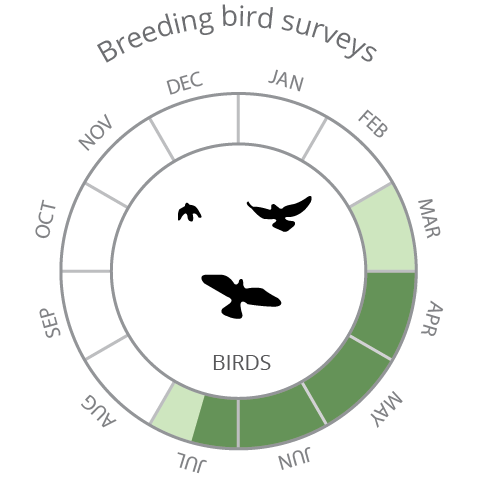 A survey for breeding birds would normally require multiple visits between April and June/July. Timing may sometimes vary depending on the ecology of the species concerned and the objectives of the work. 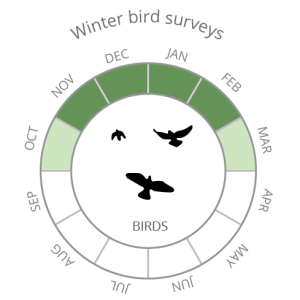 Wintering bird survey is typically carried out during the period between mid-October and mid-March, November to February being the main survey period for most species. Survey visits are typically required at intervals throughout the winter. The number of visits and survey techniques employed (such as vantage point survey, field-by-field survey, and roost counts) vary depending on survey objectives. 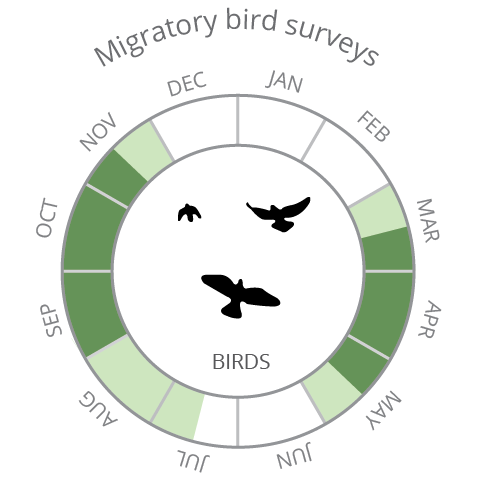 Most bird migration takes place during the spring and early summer, and during late summer and autumn. Migration periods can vary significantly between species (and different populations of the same species). The recommended survey timing and technique needs to take into account the typical migration behaviour of species of interest, the geographical location, and survey aims/objectives. 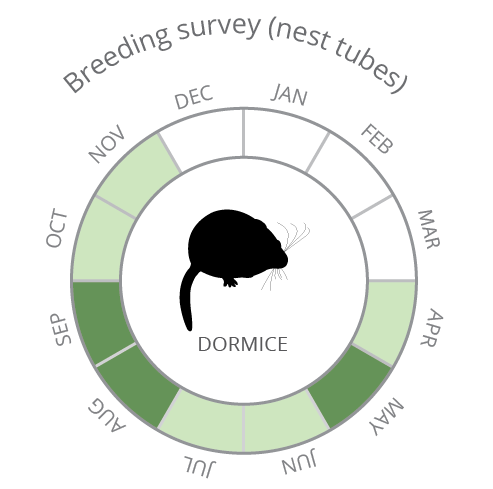 Dormice generally hibernate between mid-November and March/April. Survey during the hibernation period is not possible. The most common and widely accepted survey method involves the use of artificial nest tubes to determine presence or likely absence. 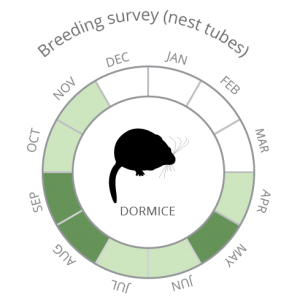 Nest tube surveys use a weighted scoring system which takes into account the months during which survey is undertaken and survey effort. 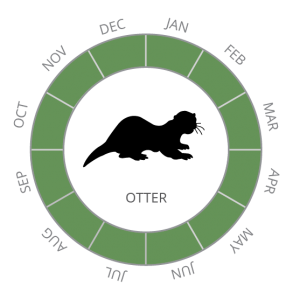 Nest tubes are ideally sampled at intervals across the active season (April-November), with May, August and September being key months for survey. Searches for feeding signs can also be completed. 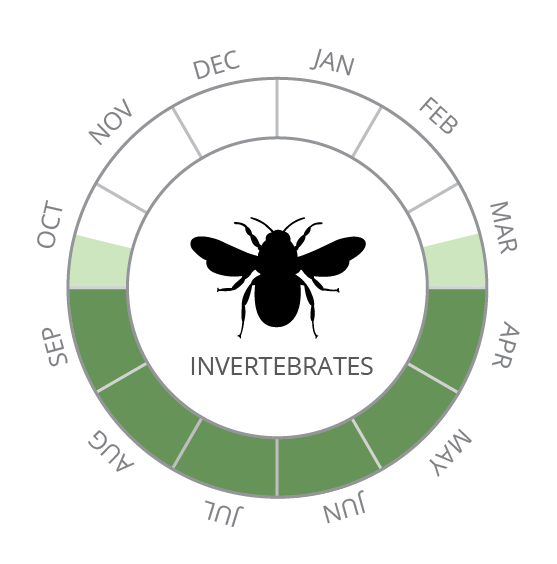 Surveys for terrestrial invertebrates can most reliably be carried out between April and September. 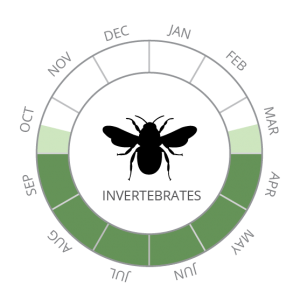 The optimal period for freshwater invertebrate survey is between June and August for standing waters, and between mid-March and April or September to mid-October for flowing waters. Weather conditions and geographic location can influence the timing of survey. Repeat visits may be required throughout a season. Survey design needs to take into account key periods of activity for any particular species of interest, which may only last for a few weeks, and advice should be sought from an ecologist in planning this work. 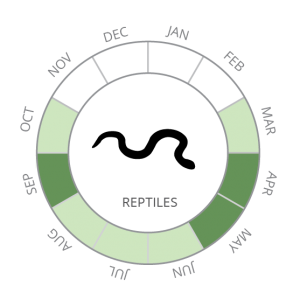 Reptiles are active between March and October. 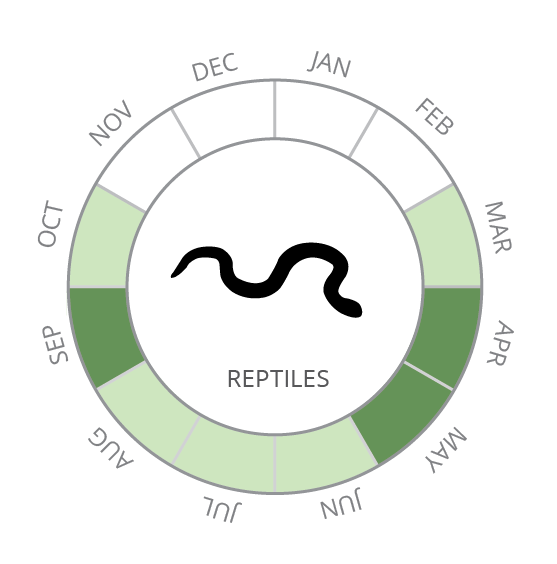 Reptile survey is best carried out during April, May and September, periods when reptiles are most visible. Several survey visits are typically required. Artificial refugia are often used to aid survey – these should be installed in advance. Further visits may be necessary to estimate population size. Survey effectiveness is influenced by weather conditions. During the summer months (June-August) reptiles are more difficult to detect as they bask less and make less use of refugia. 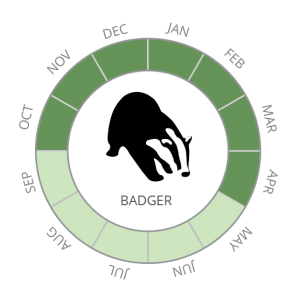 Badger survey can be undertaken at any time of year. The presence of dense vegetation can sometimes make survey during summer months difficult. Where this is a possible issue, winter/early spring may be a better period for survey, when dense vegetation has died back. 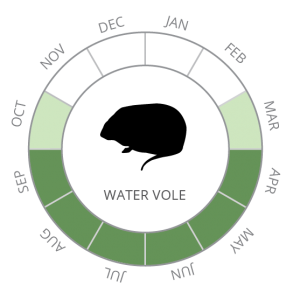 The recommended survey period for water vole is between mid-April and late September, when they are most active. 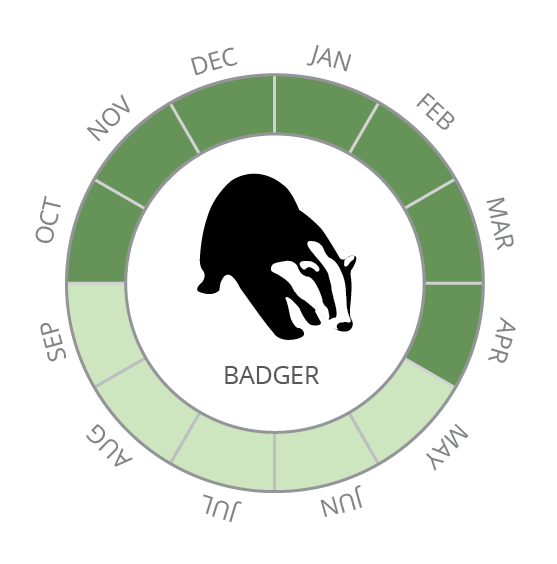 In upland habitats or northern parts of the UK the survey period is shorter (generally mid-May to mid-September, or June to August in upland Scotland). Within the survey period at least two survey visits are recommended. 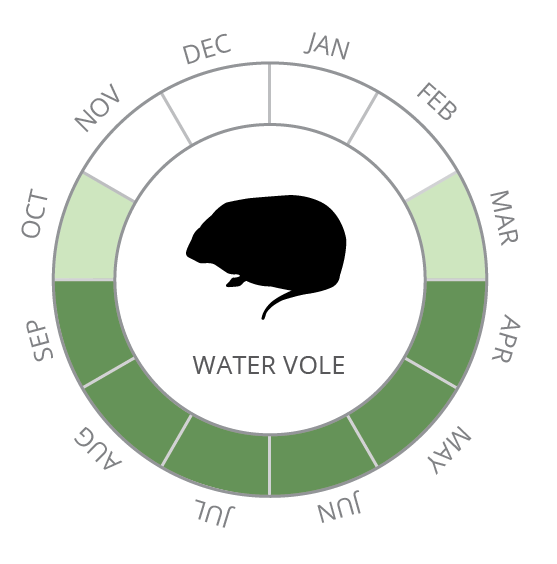 Water vole activity declines in the winter, and the species becomes harder to detect. 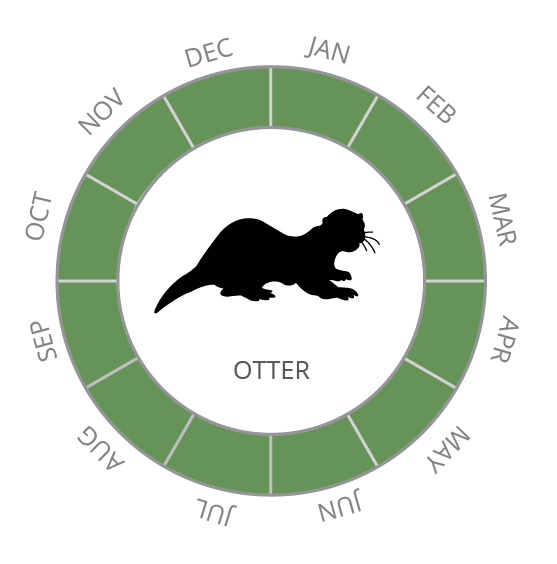 Otter survey can be completed at any time of year. Spring is often a good period to undertake survey work since riparian vegetation is not fully established, allowing better views of watercourse banks and channel features. 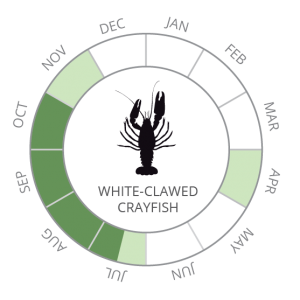 Detailed survey for white-clawed crayfish (hand searching, night searching by torch and trapping) is seasonally constrained: July to October is the optimal period for carrying out survey. Survey should be avoided in May and June when females are releasing young, and between December and March, when water temperatures are typically below 8°C and crayfish are less active. The physical characteristics of a watercourse (such as depth, rate of flow and turbidity) will influence the choice of method and survey timing. Daytime habitat appraisal (of watercourses and waterbodies) can take place at any time of year. 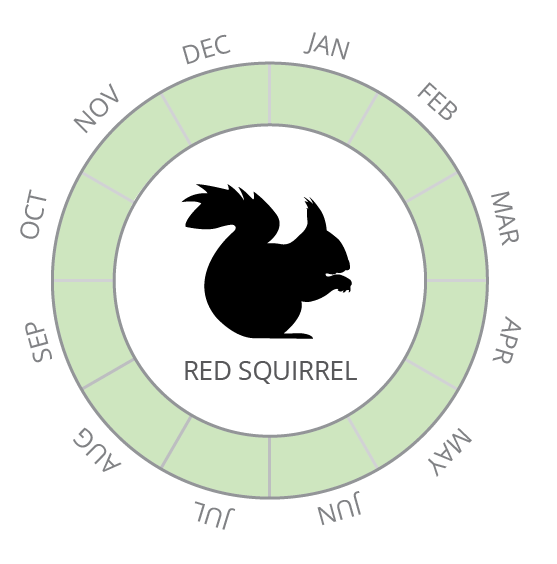 Survey work for red squirrel can be carried out throughout the year (spring and autumn are often good periods). A survey may involve multiple visits. 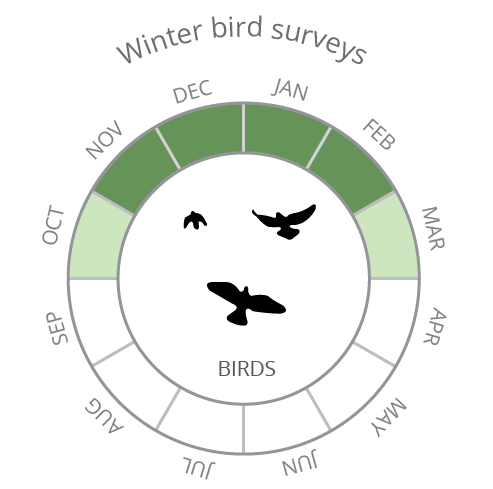 A number of techniques can be employed: visual survey, hair tube survey, drey counts, bait survey, feeding sign survey, and nest box survey (a survey licence is required for the latter). 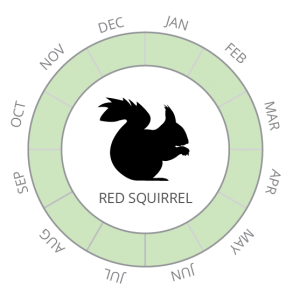 The selection of method and timing needs to take account of site characteristics (broad-leaved or coniferous woodland, woodland maturity, the potential presence of grey squirrel). Trail cameras can also be a useful cost-effective means of survey.